4 Bedroom Detached House For Sale in St. Ives for Guide Price £635,000. This virtually brand new house completed in 2017 offers stunning modern and contemporary accommodation making the most of the gorgeous sea and coastal views from both the front and the rear of the property. The accommodation comprises in brief of - A generous entrance hallway, with useful storage cupboards, a W/C, two double bedrooms, a utility room and a luxuriously appointed family bathroom. 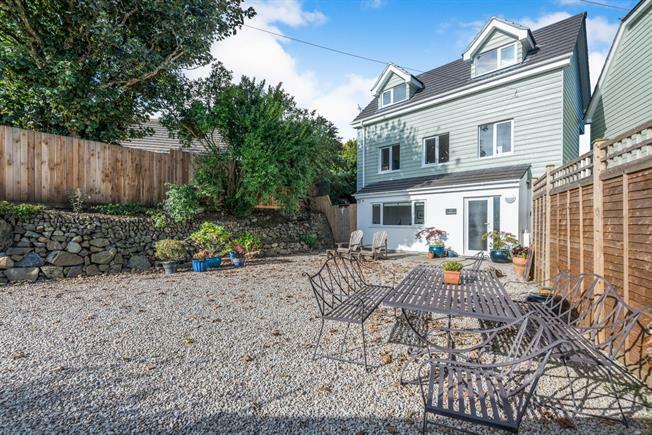 On the first floor is the open plan living space with a well appointed kitchen, a wood burning stove, a large dining area to the rear overlooking the open fields and out to sea and a door leading out onto a balcony with steps down into the rear garden. From the front of the living space there is stunning sea and coastal views. On the second floor is the dramatic master bedroom enjoying sea views at the front and the rear from the Juliet balcony, there is also a single bedroom/study and a shower room on this floor. Outside there are gardens to both the front and rear are extremely private and there is also generous parking for several cars. An internal viewing of this property is a must. A tiled entrance hallway, with useful storage cupboards, a radiator, spotlights and access into the two bedrooms, the W/C and the utility room. A useful W/C with tiled flooring, a wall mounted wash hand basin, a push button flush toilet, an extractor fan, a heated towel rail, spotlights and a frosted double glazed window to the side. A large double bedroom with carpeted flooring, a radiator, spotlights a built in wardrobe and two double glazed windows to the front overlooking the garden. A double bedroom with carpeted flooring, a radiator, a built in wardrobe, spotlights and a double glazed window to the side. A useful utility room with tiled flooring a range of high gloss wall and base units with a granite effect work surface, a single stainless steel sink, a wall mounted combination boiler and space for a washing machine and tumble dryer. There is a radiator, a double glazed window overlooking the rear garden and a part glazed door leading out to the side of the property. A fully tiled family bathroom, with a p-shaped bath with shower over, a wall mounted sink, a push button flush toilet, a extractor fan, a heated towel rail, spotlights and a frosted double glazed window to the rear. A carpeted staircase with glass balustrades leads to the first floor landing. A spacious dining room with solid oak flooring, three large double glazed windows which overlook the open field to the rear and out to sea, a radiator and a glazed rear door which leads out onto a raised decked area with steps down into the garden. A decked balcony with polished stainless steel balustrades, outside lighting and steps which lead down into the garden. A carpeted staircase with glass balustrades leads to the second floor landing. A single bedroom or useful study with carpeted flooring, a radiator and spotlights. There is a large double glazed window which enjoys stunning sea views across the whole of St Ives Bay, up to Godrevy Lighthouse and beyond. A large master bedroom with carpeted flooring, a radiator and spotlights. To the front of the property is a large window enjoying stunning sea views across the whole of St Ives Bay, up to Godrevy Lighthouse and beyond. To the rear there is a Juliet balcony with a glass balustrade and views over the opens fields and out towards the sea. A fully tiled shower room with double shower with glass screen, a concealed cistern with push button flush toilet, a wall mounted wash hand basin, a heated towel rail, a extractor fan, spotlight and a velux window. The property is approached via a five bar wooden gate onto a large private driveway which offers ample parking for several cars, with low level lighting. There are private gardens to both the front and the rear of the property. The garden to the front is low maintenance with mature planting within a Cornish Wall and ample space for alfresco dining. To the rear again the gardens are low maintenance and back onto open fields.